It can be difficult finding time to gather together as a family to learn about God and reflect on all He has done for us. Add in kids who don’t take it seriously or kids who distract others and it gets even harder. If you are struggling to get through devotions without needing to discipline one or all of your children, you may find these 7 tips helpful. Have my children out-grown the language or stories in our current devotional book? Is the material too far above their heads? Do my children learn best with pictures, words or movement? Can I get additional copies of the book for the distracted ones to use to read along? What can I do to prepare ahead of time to make sure that all age levels are engaged? Take the material in small chunks, asking questions to engage the listeners as you go along. Consider switching things up. Change the location, change the structure, or change the time of day. Variety is the spice of life and there is no reason why you can’t enlist the help of the multiple resources available to make your devotion time more vibrant. 2) Have them participate, even lead. You kids will engage more fully in devotion time if they feel that they are a necessary part of it. Designate certain jobs such as: Scripture-reader, song-chooser, question-asker or prayer-recorder. You may even want to let older children lead the devotion times on a rotating basis. 3) Help them see the importance. Ask your children how they would feel if they went a whole day without eating. Explain to them that our hearts need fuel just like our bodies do. Our hearts are homes to Jesus and they need to be filled regularly with time in His word, prayer and spiritual discussions with other people who believe the same as we do. Without this time with God every day, our hearts will start to run on empty and we may find that we want to fill it up with other things that are fun for a moment, but hurt us in the long run (like getting others in trouble, acting selfish, or disobeying Mom and Dad). 4) Be excited yourself. If you approach devotions as just another thing to check off your morning or evening routine, your children won’t be able to muster any more enthusiasm than you have. Think about the reasons for having devotions with your children: to develop godly habits, to “spur them on to love and good deeds,” to feed their spiritual hearts, and to lay a foundation of knowledge and faith that will go with them where ever they go, even when you can’t. 5) Take their spiritual temperature. If you’ve noticed your child pulling away and becoming disinterested in the things of God in general, sit down and talk to him about it. Let him know what you have noticed. Tell him that high and low points are normal in any Christian’s spiritual walk with God. Find out if there is some internal chatter from worldly interests that is crowding out a desire for things of God. Problem solve together to find ways that he can get his heart back on track. 6) Find out the underlying cause of the resistance. There may be an unspoken hurt in the family that is fueling the disconnect or distractions during devotions. Maybe someone needs to apologize. Maybe that someone is you. Find out what is underneath the resistance and encourage your child to go to the person to tell them how he feels. 7) Pray about it and take action. 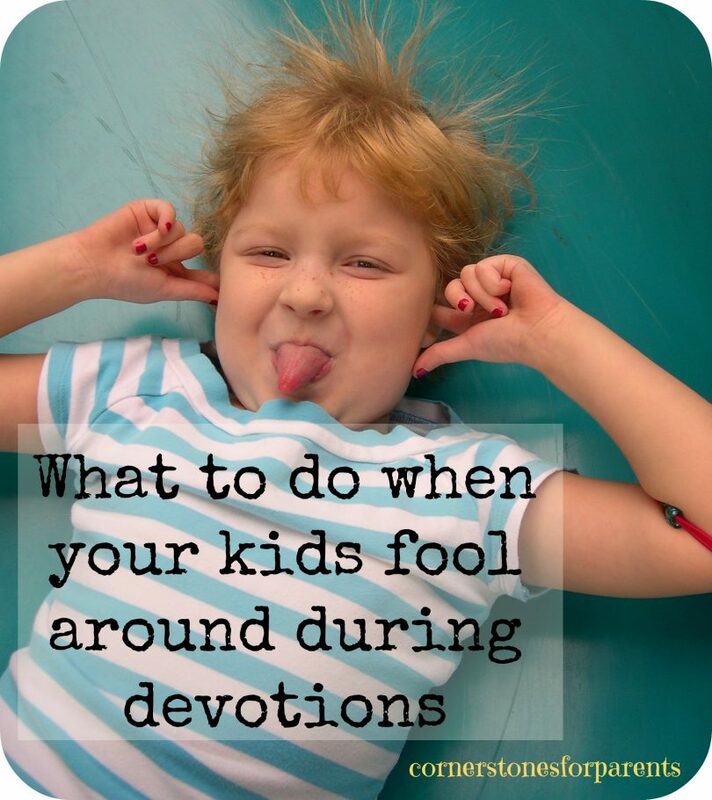 If your children are fooling around during devotions, pause for a moment and take a deep breath. Ask God to help you re-group in a way that is honoring to this special time with Him. Ask your children to pray with you as you seek God’s help to get everyone focused on Him. If the Lord leads, you may find that you need to ask your distracting child to step out of the room. One child cannot be allowed to become the spiritual stumbling block for your other children. Go to that child later to complete the devotion and discuss what Jesus meant when He said what He did in John 18:1-10. These seven tips will hopefully help you turn your family devotion time into a mutually anticipated regular event.